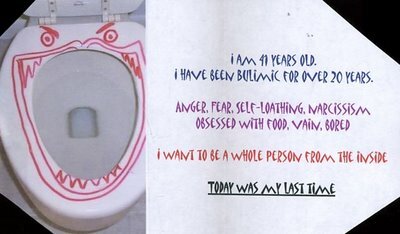 This postcard from PostSecret made me want to stand up and cheer for the writer. Managing bulimia is an ongoing practice, but every day starts with that rededication. That was “The Last Time” can be a reality if you just nuture and love yourself. Thank you for posting, I wish her well and hope she gets the help she needs. Because I now know that it may never be the last binge, I am able to handle my binges better and accept that I have a problem that will take time to heal.